As employees move among these categories, different parts of USERRA may apply. A candidate not being considered for a job because some of her Reserve duties conflict with the company’s normal working hours. A job-seeker not being considered for a job because he may be required to perform extended periods of military service with the National Guard or Reserves (i.e., a deployment overseas). USERRA does not automatically entitle service members to a civilian position. Employers are allowed to reject a service member’s job application as long as the decision is not influenced by the job-seeker’s military service. Actively engaged in civilian employment. USERRA protects members of the uniformed services during employment. Employers cannot take military service into account when they fire, discipline, promote, or award benefits to employees. In addition, employees may not be retaliated against for exercising their USERRA rights, for filing a complaint under USERRA, or for assisting others in exercising their USERRA rights. For instance, if an employee believes his USERRA rights have been violated and files a complaint, the employer may not respond by firing, demoting, or otherwise retaliating against him. An employee being disciplined because he had to perform military duty during working hours. Preparing for military deployment. Before starting her military service, an employee must notify her employer verbally or in writing if the service conflicts with work. While it is often easier to give notice well in advance, there is no specific time limit required. ​If the period of service is more than 30 days, the employee may be required to provide copies of military orders after the period of military duty ends if she wishes to resume working, unless doing so is impossible or impracticable. The employee may also be required to provide orders after a period of military duty ends if she requested to use any type of paid leave while away on military duty. Away on military deployment. USERRA provides a number of protections for employees who are absent from civilian work due to voluntary or involuntary uniformed service. The goal is to treat the absent employee the same as if he had never left for military duty. During these absences, the employee is deemed to be on a leave of absence or furlough, although he may use paid leave if desired. 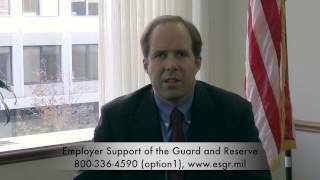 The employee must be given the same benefits that are generally provided to a non-military employee who goes on a furlough or leave of absence. For absences of 31-180 days, the service member has 14 days to contact the employer and request reemployment. For absences of more than 180 days, the service member has 90 days to contact the employer and request reemployment. Extra time is allowed if the service member is recovering from an injury suffered during military service. Once a request for reemployment is made, the service member must be reemployed promptly (if federally employed, he must be reemployed no later than 30 days after his request). If a service member does not make a timely request for reemployment, she is still entitled to prompt reemployment, but may be subject to discipline by her employer in the same manner as other employees with unauthorized absences. An employee may perform up to five years of military service and still be fully entitled to reemployment. This is a cumulative total and starts over every time the employee switches employers. For example, if a member of the National Guard has separate deployments lasting six months, one year, and three years with one employer (for a total of 4 ½ years with that employer), and then changes jobs and is deployed for an additional two years, she is entitled to reemployment each time she returns. In addition, there are many exceptions to this five-year limit that exempt certain types of service from counting toward the five-year total. Once a service member reaches the five-year limit, they may still be reemployed, but would be subject to discipline by the employer, as with an untimely request for reemployment. If they receive an unfavorable discharge from the military, such as a discharge for bad conduct. If their original job (before deployment) was temporary, with no reasonable expectation that it would continue indefinitely or for a significant period. For example, a service member who spends a day painting fences for a home-improvement contractor would not be entitled to reemployment. Once a service member is reemployed, USERRA provides guidelines on what position she is entitled to. Generally, the employee must be given the position she would have held had she remained continuously employed. (This is often referred to as the “escalator principle.”) This may result in a promotion or other advancement. If an employer thinks that a service member is not qualified to perform this job, the employer must provide training or other experience to boost the employee’s skills to the required level. If the employee cannot be trained through reasonable efforts, she is still entitled to her former position. In some cases, where the employee was absent for more than 90 days due to military service, the employer may choose to reassign the employee, but it must be to a job of similar seniority, status, and pay as the employee’s former position. In addition, returning service members have added job security. If they were absent for 31-180 days, they are protected against being terminated without cause for six months. If they were absent for more than 180 days, they are protected against being terminated without cause for one year. However, all returning service members can be terminated for cause at any time. USERRA does not protect service members if, for instance, they improperly miss work for reasons not related to their military service.